John the Baptizer (so as NOT to be confused with any christian denomination) is foretold in the Old Testament as well as his purpose. The prophetic references are located in the books of Isaiah and Malachi. These prophecies proclaim that the One whose way is to be prepared by John the Baptizer is Jehovah God Himself. The fulfillment of these prophecies is written in the gospels according to Matthew, Mark, Luke, and John. 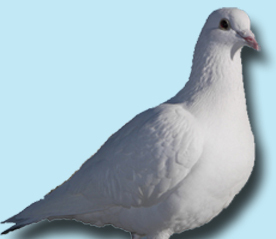 'Malachi' is translated from the Hebrew word meaning my messenger. The Hebrew word is frequently translated 'angel'. The New Testament Greek equivalent is angelos. "Behold, I will send my messenger, and he shall prepare the way before me: and the Lord, whom ye seek, shall suddenly come to his temple, even the messenger of the covenant, whom ye delight in: behold, he shall come, saith the LORD of hosts" (Malachi 3:1). 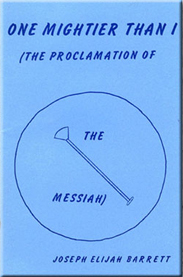 This 'messenger of the covenant' is Jesus. Isaiah 42:6 says, "I the LORD have called thee in righteousness, and will hold thine hand, and will keep thee, and give thee for a covenant of the people, for a light of the Gentiles." Since 'messager of the covenant' and 'Lord' in Malachi 3:1 are identical, 'Lord' refers to Jesus too. 'Lord' is translated from the Hebrew 'adon'. It means sovereign, master, owner; it never refers to God. How can Jesus be referred to as 'adon' when he is God in the flesh? Jesus has a dual (two) nature - God and man. 'Adon' points to Jesus as man. Malachi 3:1 pictures Jesus in both his deity and in his humanity. Jesus is the sender and the sent; "Jesus said unto them, If God were your Father, ye would love me: for I proceeded forth and came from God; neither came I of myself, but he sent me" (John 8:42). John the Baptizer prepared the way for Jehovah in the flesh. "The voice of him that crieth in the wilderness, Prepare ye the way of the LORD, make straight in the desert a highway for our God. Every valley shall be exalted, and every mountain and hill shall be made low: and the crooked shall be made straight, and the rough places plain: And the glory of the LORD shall be revealed, and all flesh shall see it together: for the mouth of the LORD hath spoken it" (Isaiah 40:3-5). Isaiah's prophecy declares that John the Baptizer will prepare the way for Jehovah (LORD). This truth is revealed in Isaiah 40:3. Although the name of Jesus' forerunner is not mentioned in either Old Testament prophecy, it is intimated. "Behold, I will send my messenger..." (Malachi 3:1a). God's forerunner or herald is declared to be commissioned and sent by God Himself. This herald is John the Baptizer. The name John in the Hebrew is Jehohanan. The name means 'whom Jehovah gave'. Isaiah prophesied that the way would be prepared for God while Malachi prophesied that the way would be prepared for man. Although separated by about 300 years, these two prophesies are identical. Isaiah viewed God through His deity while Malachi viewed God through His humanity. "In those days came John the Baptist, preaching in the wilderness of Judea, And saying, Repent ye: for the kingdom of heaven is at hand. For this is he that was spoken of by the prophet Esaias, saying, The voice of one crying in the wilderness, Prepare ye the way of the Lord, make his paths straight" (Matthew 3:1-3). Matthew quoted Isaiah 40:3 and the Jews should have recognized it because it is a part of their scriptures. In Matthew 3:11 John says, "I indeed baptize you with water unto repentance: but he that cometh after me is mightier than I, whose shoes I am not worthy to bear: he shall baptize you with the Holy Ghost, and with fire." After John the Baptizer was imprisoned by Herod, he sent two of his disciples to find out if Jesus was he who was prophesied to come. Matthew 11:10 records Jesus' reply, "For this is he, of whommit is written, Behold, I send my messenger before thy face, which shall prepare the way before thee." That Old Testament quote is taken from the Greek word angelon. This word is equivalent to malak in Malachi 3:1. Here Jesus boldly announces that he is the one who was prophesied to have the way prepared for. The gospel according to Matthew contains both Old Testament prophecies. Isaiah 40:3 is quoted in Matthew 3:3 and Malachi is quoted in Matthew 11:10. "And let them make me a sanctuary, that I may dwell among them. According to all that I shew thee, after the pattern of the tabernacle, and the pattern of all the instruments thereof, even so ye shall make it" (Exodus 25:8-9). The Old testament is full of shadows or types of things that will be revealed in the New testament. As a matter of fact, every New testament doctrine is foreshadowed in the Old Testament. And that includes God manifest or revealed in the flesh. The Israelite tabernacle in the wilderness is a perfect and complete type which illustrates how God would walk among man just as He did with Adam. Except this time it would be to redeem man back to Himself. 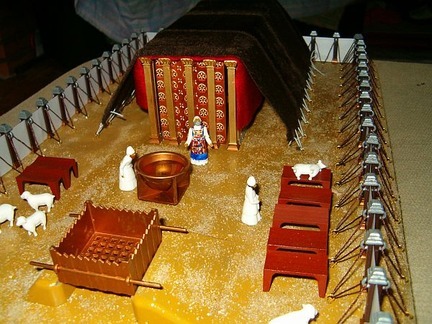 The tabernacle was a tent or temporary shelter. God gave Moses detailed instructions when he was on Mount Sinai for forty days and forty nights on how to construct not only the tabernacle, but the ark of the covenant as well. The tabernacle consisted of three parts: the courtyard or outer court, the holy place, and the holy of holies. The courtyard housed the brazen altar and the laver; inside the holy place stood the table of shewbread, the golden lampstand, and the golden altar of incense. Within the holy place hung a veil which divided it; this veil hid the third part of the tabernacle - the most holy place or the holy of holies. Exodus 25:10-22 describes the Ark of the covenant and the mercy seat. The mercy seat laid on top of the Ark. It was made of pure gold; on either end of the mercy seat stood two golden cherubims (cherubims were the highest order of God's angelic creation - Lucifer was a cherubim). "And thou shalt put the mercy seat above the ark; and in the ark thou shalt put the testimony that I shall give thee. And there I will meet with thee, and I will commune with thee from above the mercy seat, from between the two cherubims which are upon the ark of the testimony, of all things which I will give thee in commandment unto the children of Israel" (Exodus 25:21-22). The only individual who could stand in the presence of God was the high priest - and that only once a year. Prior to entering the holy place, the high priest had to sacrifice at the brazen altar	and wash at the laver. The tabernacle looked plain and common from the outside; it was not at all apparent that the tabernacle shielded from view and presence God Himself. Jumping to the new testament, we read in John 1:14, "And the Word was made flesh, and dwelt among us, (and we beheld his glory, the glory as of the only begotten of the Father,) full of grace and truth". The word 'dwelt' is translated from the Greek word which means 'tabernacled'. Jesus the Christ was the antitype or fulfillment of the Old Testament tabernacle in the wilderness. Physically he looked plain and common; inside His body however lived God Almighty. "For he shall grow up before him as a tender plant, and as a root out of a dry ground: he hath no form nor comeliness; and when we shall see him, there is no beauty that we should desire him" (Isaiah 53:2). Jesus the Christ was the veil which hid Jehovah God. "By a new and living way, which he hath consecrated for us, through the veil, that is to say, his flesh" (Hebrews 10:20). A veil separated the holy place from the holy of holies where God dwelt. "And thou shalt hang up the vail under the taches, that thou mayest bring in thither within the vail the ark of the testimony: and the vail shall divide unto you between the holy place and the most holy" (Exodus 27:33). The tabernacle is a perfect illustration of the inspiration of the Bible; it was inspired by God because He described in detail how He would manifest Himself in the flesh through the Old Testament tabernacle. “Nevertheless I tell you the truth; It is expedient for you that I go away: for if I go not away, the Comforter will not come unto you, but if I depart, I will send him unto you” (John 16:7). Let me first of all establish the identity of the Comforter. John 16:26a tells us: “But the Comforter, which is the Holy Ghost…” Comforter, Spirit of Truth (John 15:26), and Holy Ghost (or Holy Spirit) are all synonymous titles. Jesus makes it very plain in John 14:16-18 that He is the Comforter: “And I will pray the Father, and he shall give you another Comforter, that he may abide with you for ever; Even the Spirit of Truth; whom the world cannot receive, because it seeth him not, neither knoweth him: but ye know him; for he dwelleth with you, and shall be in you. I will not leave you comfortless: I will come to you”. Jesus tells His disciples in verse 17 that He is the Comforter. His physical presence fulfills that role. But in verse 16 He tells them that the Father will give them ‘another’ Comforter. New Testament Greek has two words which are translated ‘another’. One word (allos) means ‘another of the same kind’ while the other word (heteros) means ‘another of a different kind’. The Greek word used in John 14:16 is ‘allos’. Jesus tells His disciples that He will continue to dwell with them in a different manner. Instead of being with them physically, He will dwell with them by His Spirit (verse 17: “…and shall be IN you”). Notice the time when Jesus will indwell His disciples – sometime in the future (will, shall). John 14:16-18 and 16:7 were fulfilled on the day of Pentecost. The day of Pentecost was the very first manifestation of the Holy Spirit (Acts 2:1-4). However the SPIRIT of God was ALWAYS in existence. John 4:24 is NOT talking about the manifestation or ministry of the Holy Spirit, but the truth that God as to His essence IS Spirit and He is immaterial. This distinction between essence and manifestation is crucial. The Spirit of God (John 4:24) is eternal. John 14:16-18 and 16:7 are declaring the future MANIFESTATION or MINISTRY of the Holy Ghost while John 4:24 declares God’s essence. This is another reason why the doctrine of the trinity is bankrupt. It states that God is three coexistent and coeternal Persons. But while God ALWAYS existed (He is eternal), He DID NOT always occupy the ministry of Holy Ghost. And to drive home that point even more, the Bible tells us the ‘job’ of the Holy Spirit. “But the Comforter, which is the Holy Ghost, whom the Father will send in my name, he shall teach you all things, and bring all things to your remembrance, whatsoever I have said unto you” (John 14:26). And just as God did NOT always occupy a body (known as the Son), the Son IS neither eternal nor coeternal. The titles or manifestations of Son and Holy Ghost were occupied by God in time. In other words, before the day of Pentecost, the Holy Ghost was not in the world and before Mary gave birth to Jesus, the Son did NOT exist. God however ALWAYS existed; and His name is Jesus. The Holy Ghost is our helper; he will remind us of God’s Word and teach and guide us just as He reminded Jesus’ disciples what Jesus taught them while He was physically with them.